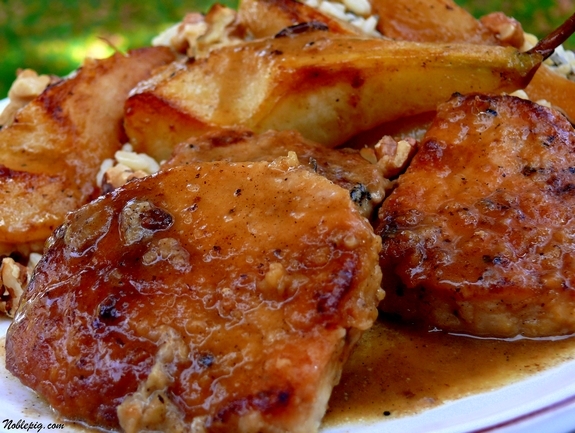 Pork, pears and cider are a very natural combination, one I love. 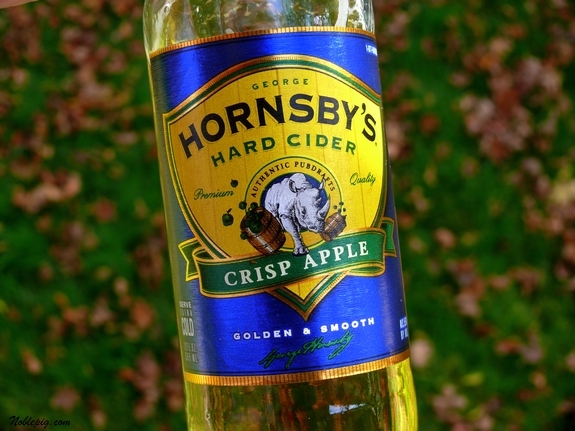 This recipe uses “hard” cider (with alcohol) because of its crispness and acidity. Never had hard cider? Look for it wherever beer is sold, it might be your new favorite adult beverage. It’s very, very good and can be purchased year round. Non-alcoholic apple cider works great too (not the Treetop or Mott’s brand…real, fresh apple cider, which is easily found this time of year). Anyway, this meal is pretty tasty. The pork tenderloin stays juicy and the pears are pretty incredible too. Paired with the easy to make wild rice, this meal is always well received at my home with thumbs up from the husband and my oldest son. My youngest had spaghetti, he will come around one day. This meal is also company worthy, it’s very satisfying and looks and smells incredible while cooking. Hard cider is made from fermented apple juice and has about the same or higher alcohol content as beer. It comes in a six-pack, we love it at my house. 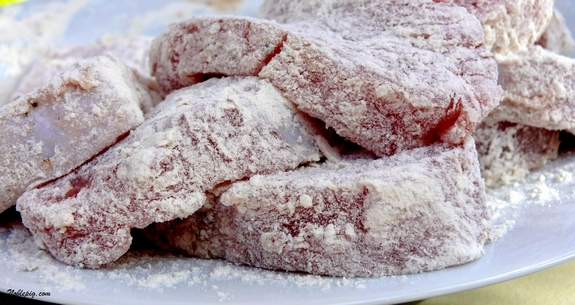 Season pork generously with salt and pepper, then dredge in flour. Set aside. In a large skillet (not nonstick), melt butter over medium-high heat. 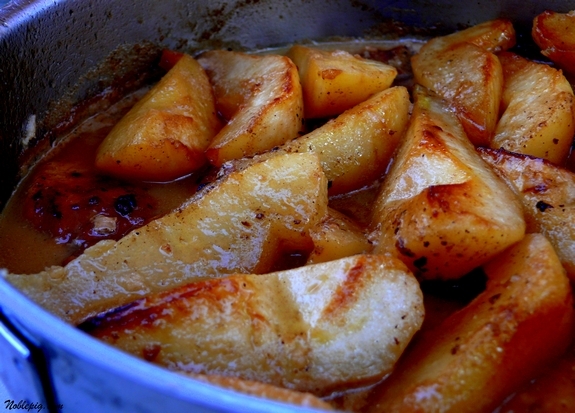 Add pears and sauté until lightly browned on all sides; remove from pan. 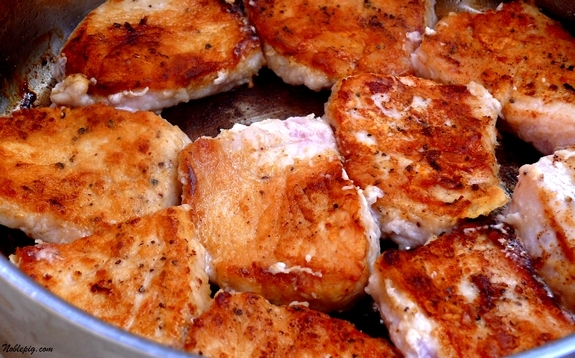 Add pork medallions to the same pan, sautéing for 2 minutes on each side; remove from pan. Combine broth, cider and cream; add to the pan and deglaze. Bring to a boil, then add vanilla pod and seeds. Boil until reduced by half, about 4 minutes. Return pears and pork to the pan (pork on the bottom) along with any accumulated juices. Boil until thicker, about 4-6 minutes. (The sauce will also thicken a bit when it’s removed from the heat.) Season with salt and pepper before serving. Here is the Walnut Wild Rice, recipe to follow. Toast walnuts in a small skillet over medium heat for about 6 minutes. Boil cider, broth and butter in a saucepan; add rice mixture. Cover, reduce heat and simmer on low 25 minutes or until the liquid has absorbed. Season with salt and pepper. Garnish with toasted walnuts. This recipe is so authentically a “fall” recipe. Geez, all the flavors are just amazing, you are really incredible with matching flavors!!! This looks like a fabulous recipe. My mom is going to be visiting for a month over the holidays and this sounds like a perfect meal to make while she’s here. As always, fabulous photos. Wow does that look good–I’m adding it to my lineup!! Love the coloring/browning you got on those pork chops! The meal looks so good! I love how golden brown you got the pork chops. This looks amazing. Definitely bookmarking this one to go into the holiday rotation. Heck, I might even make it this week! Wow, now that is dinner. Very nice, I’m always looking for a new way to make pork tenderloin. you got the good stuff: hard cider in here. yes, now this is perfect with a bit of vanilla. I wonder if I should go to one of those bigger liquor marts and see if they have hard cider? I wonder if it’s legally sold in Taxachusett? OMG. This looks divine. You have GOT to post a recent photo of yourself. You’ve posted so many recipes lately and I can only imagine you’ve gained a hundred pounds since you’ve moved. All look fantastic! Oh my, we’re supposed to be having salad for dinner but it may have just got canned. This looks so wonderful. Love cider and well, how ’bout those Riviera pears from Oregon, eh? what a great use for apple cider! iâ€™m intimately familiar with the apple-pork combination, and itâ€™s no stretch to think that pears would be just as good. especially if apple cider is also involved. and vanilla. yum. Your food always looks so delicious! I need to learn to wait to read your blog until after I have lunch! Bookmarked. This recipe is SCREAMING at me to make it. I will be on the lookout for some hard cider. I wish I had seen this recipe before I cooked that pork chop last night. This is like dinner and dessert all in one with the fruit and vanilla and nuts and pork. Yes, that’s a good thing. I just loved watching that photo download! Yum is all I can say. I haven’t cooked pork is a long time. Gotta do it now. What a great combination of flavors. Perfect is right! I’ve never cooked with hard cider but now I’m curious. I bet it’s great in the wild rice, too. Really interesting combination- I’ve never thought to do pears with pork- but it would be every bit as good (and maybe better) than apples. And the hard cider would be fun. I like the rice recipe with it. I just caught up with the past week and a half of you. Everything is amazing. This pork sounds so perfect for cool weather then when I read cream in the ingredients, oh wow. The pumpkin soup is so rich looking and the stuffed squash, well I might even eat greens done like this. And I only really eat turkey because of the potatoes and gravy and cranberry sauce. As always you are a woman who has a gift. Be blessed this week. Oh yeah, the kids are adorable, so boyish, love that. I was a garden gnome. I hope you’re opening a restaurant at your winery! You should write a cookbook and sell it! What a beautiful dish. The pears have a gorgeous color to them! Wow, I wish I could come over to your house right now! I’ve never tasted hard cider before, but that meal looks out of this world!! Came here because of the awesome post title and am so glad I did. Okay that’s it, I’m making this tomorrow! 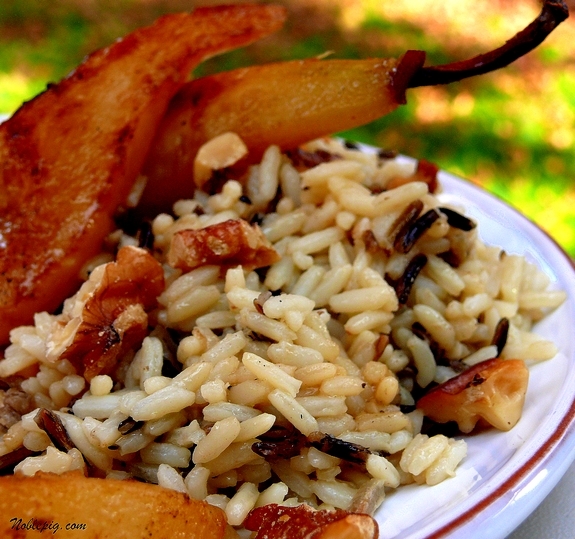 Pork is always good with fruit accompaniments, and your walnut wild rice looks divine! This has the most beautiful color to it. I have pork tenderloin and pears. I just found dinner. Terrific recipe– how did I miss that on Cuisine at Home? I subscribe to that, and love the magazine. The name of this dish alone insighted drool and then the picture of the perfectly browned-crusted meat and those golden pears. This will have my family eating out of my hands. Thank you for bringing such quality recipes to our attention. I’ll admit it. The first time I saw vanilla paired with pork, I was skeptical. But, after I tried it… I was a devotee. Awesome combo. This looks beyond fabulous. Your pictures always draw me in and I just want to make everything. This is no exception. Looks delicious. To tired to cook, to hungry not to eat, this looks so wonderful. This looks sooooo good. I definitely need to try this one. Looks delicious – creative choice of ingredients! This looks like a perfect fall meal! This is a perfect autumn meal! I love the addition of vanilla here, perfect! I love the ingredients you’ve combined for this wonderful meal. Your pictures are fabulous. That pork looks gorgeous. Kudos. Wowsers but this is gorgeous. Just gorgeous. I want to dive into the pan. I am looking for a lower cost for less people (so less food) idea for Thanksgiving and I wonder if this could be it?…. We made this last night for dinner and it was without doubt, incredible. Thanks so much for sharing the recipe with all of us! I just made this for dinner and it was delicious! I didn’t have a vanilla bean so I used a little bit of vanilla extract and it was still wonderful. 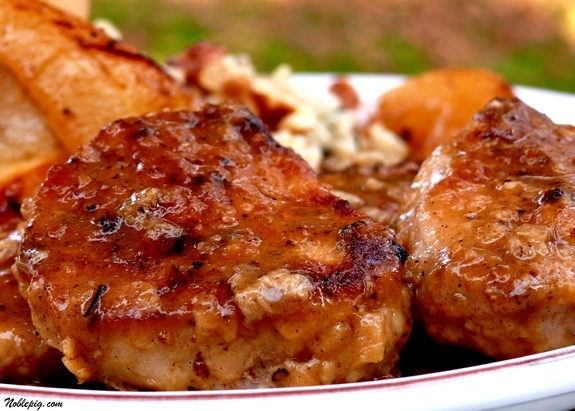 I am always looking for something new to do with pork; Thanks for a great recipe! I also made this for dinner last night and it was fabulous! Like Stacey, I didn’t have a vanilla bean so I subsituted with vanilla extract. Thank you for a fabulous recipe! Your presentation is so incredibly enticingâ€”expertly paired flavors, gorgeous execution of the recipe and photographs that make us all drool. This one is definitely going out to our Twitter fans (via @zupans)! This is beautiful – a truly inspiring dish and a gorgeous presentation! I made this tonight, and it was amazing! I’m so glad that your beautiful photos inspired me to make this. I love trying new things…and luckily my husband is very receptive to it! This looks really yummy! I always need recipes for pork. And more for fish too, okay? I’m not a great cook. This is a perfect start. I will begin today. Various people in the world take the mortgage loans from different creditors, just because that’s fast and easy. Set your own life time more easy get the loans and everything you want. Um, um, good!! In a cost cutting mode, I used pork loin instead of tenderloin, and I used 1-2 tsp vanilla extract instead of vanilla beans. I think it worked very well. made this 2 nights ago. so delicious and really DOES make your house smell amazing. i, too, had to use a little vanilla extract and things worked out just fine. great fall dish! Any advice about how many this will server? I want to make this for a dinner party of around 10 folks and wasn’t sure if I should double the recipe or not! Looks soooooo gooooood! I made the pork as directed, except with boneless pork chops instead of tenderloin. They weren’t as tender as I would have liked, a problem I am having with pork chops lately and certainly not a fault of the recipe. For a family get together, I decided to make it with chicken. I did braise the chicken in the sauce for a while and thickened it with a little cornstarch, because I am a gravy sort of person. It was a big hit, and the leftovers heated up nicely for lunch the next day. Made this tonight, with ginger hard cider instead of apple. (Perfect substitution if you love ginger as much as I do.) It was so wonderful. Thanks! Made this last night. Delicious! And the texture of the pears was so velvety! 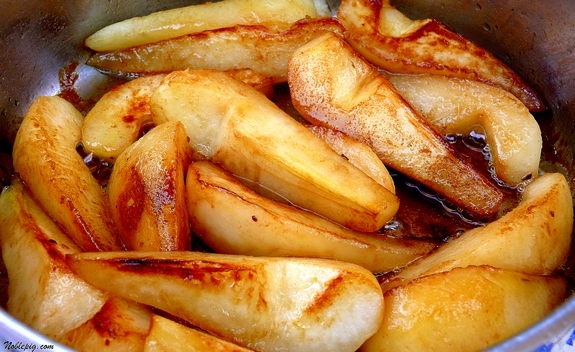 We have a boat load of Asian pears would they work well with this recipe. I’m going to try it just thought I;d get your advice.